WIKILEAKS FOUNDER JULIAN Assange will stand by his offer to be extradited to the US to face charges there, one of his lawyers has suggested. Assange last night welcomed the decision by US President Barack Obama to commute the sentence of Chelsea Manning, jailed for leaking classified US documents, while calling for an end to a “war on whistleblowers”. “I welcome President Obama’s decision to commute the sentence of Ms. Chelsea Manning from 35 years to time served,” Assange said in a statement sent to AFP by one of his lawyers. He said Manning should never have been convicted and described her as “a hero, whose bravery should have been applauded not condemned”. 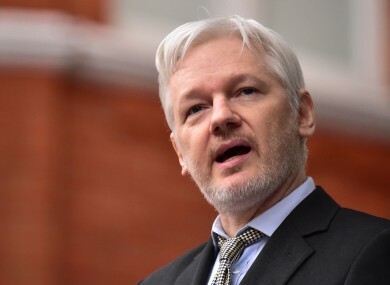 “In order for democracy and the rule of law to thrive, the government should immediately end this war on whistleblowers, and publishers such as WikiLeaks and myself,” Assange added. Manning was convicted in August 2013 of espionage and other offenses after admitting to leaking 700,000 sensitive military and diplomatic classified documents to WikiLeaks. A transgender soldier, she was sentenced by military court martial as Bradley Manning and has since been held in an all-male prison, where the 29-year-old has attempted suicide twice. Earlier this month WikiLeaks said on Twitter that Assange would agree to US extradition if Obama were to grant Manning clemency. Assange made no mention of this in statement last night. However, Melinda Taylor, one of his lawyers, suggested he wouldn’t go back on his word. “Everything that he has said he’s standing by,” she said in a brief telephone conversation with The Associated Press. Assange has been living in the Ecuadorian embassy in London since June 2012 to avoid being extradited to Sweden, where he faces sexual assault allegations, claiming he fears he would be extradited from there to the US over his role in the leaks. Following the White House announcement that Manning will now be released in May, Assange’s legal team did not immediately comment on whether Assange’s promise still stood. Email “Assange 'standing by' offer to be extradited to US - lawyer”. Feedback on “Assange 'standing by' offer to be extradited to US - lawyer”.